Nagarjuna (ca. 2nd century C.E.) was among the greatest patriarchs of Mahayana Buddhism. Many Buddhists consider Nagarjuna to be a "Second Buddha." His development of the doctrine of sunyata, or emptiness, was a significant milestone in Buddhist history. However, little is known about his life. It is believed Nagarjuna was born into a Brahmin family in south India, possibly in the latter part of the 2nd century, and he was ordained as a monk in his youth. Most of the other details of his life have been lost in the fog of time and myth. To understand Madhyamika, it's essential to understand sunyata. Very simply, the doctrine of "emptiness" states that all phenomena are temporary confluences of causes and conditions without self-essence. They are "empty" of a fixed self or identity. Phenomena take identity only in relation to other phenomena, and so phenomena "exist" only in a relative way. This emptiness doctrine did not originate with Nagarjuna, but his development of it has never been excelled. All things (dharmas) exist; affirmation of being, negation of nonbeing. All things do not exst; affirmation of nonbeing, negation of being. All things both exist and do not exist; both affirmation and negation. All things neither exist or do not exist; neither affirmation nor negation. Nagarjuna rejected each of these propositions and took a middle position between being and nonbeing -- a middle way. An essential part of Nagarjuna's thinking is the doctrine of Two Truths, in which everything-that-is exists in both a relative and an absolute sense. He also explained emptiness in the context of Dependent Origination. which states that all phenomena are dependent upon all other phenomena for the conditions that allow them to "exist." Nagarjuna also is associated with the Prajnaparamita sutras, which include the well-known Heart Sutra and Diamond Sutra. Prajnaparamita means "perfection of wisdom," and these are sometimes called the "wisdom" sutras. He didn't write these sutras, but rather systematized and deepened the teachings in them. According to legend, Nagarjuna received the Prajnaparamita sutras from the nagas. Nagas are snake-beings that originated in Hindu myth, and they make a number of appearances in Buddhist scripture and myth as well. In this story, the nagas had been guarding sutras containing teachings of the Buddha that had been hidden from mankind for centuries. The nagas gave these Prajnaparamita sutras to Nagarjuna, and he took them back to the human world. In the Transmission of the Light (Denko-roku), Zen Master Keizan Jokin (1268-1325) wrote that Nagarjuna was the student of Kapimala. 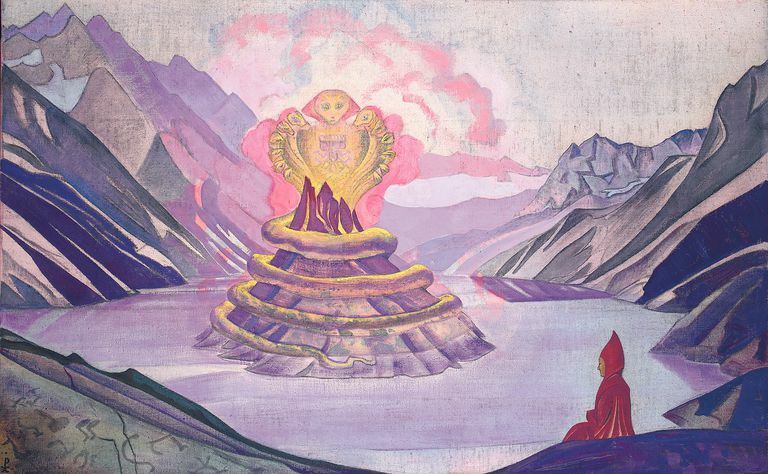 Kapimala found Nagarjuna living in isolated mountains and preaching to the nagas. The naga king gave Kapimala a wish-fulfilling jewel. "This is the ultimate jewel of the world," Nagarjuna said. "Does it have form, or it is formless?" Kapimala replied, "You do not know this jewel neither has form nor is formless. You do not yet know that this jewel is not a jewel." On hearing these words, Nagarjuna realized enlightenment.